GAROWE, Somalia Jan 30, 2015 (Garowe Online)— One week after breakaway Somaliland region declared its navy has confiscated a Sudanese-registered ship carrying a large consignment of arms and battlewagons; its neighboring semiautonomous Puntland region has accused it of being the owner of the ‘illegal arms' on board, Garowe Online reports. 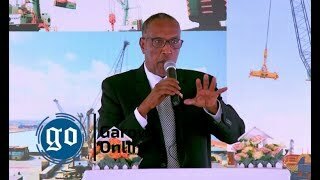 The ship that authorities said was destined for Dubai was seized at the Berbera port, the largest in Somaliland after soldier’s intercepted ‘strange’ cargo without loading manifesto. 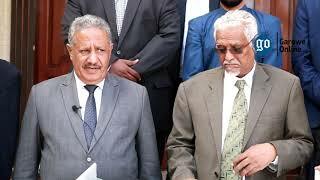 Somaliland officials have since kept details about the ship secret, prompting questions from the UN Monitoring officials who were reportedly denied access into the seized ship. Speaking at a press conference in the state capital of Garowe on Friday, Puntland Security Minister Hassan Osman Allore has accused Somaliland of importing the ships in defiance to the UN’s 1992 Somalia arms embargo. 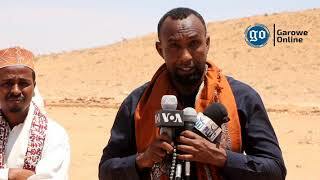 “We report the development to Somalia Federal Government and neighboring countries,” said Allore. 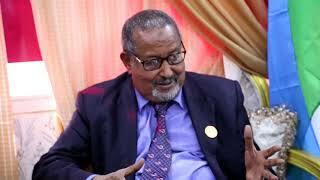 Mr. Allore has also blamed Somaliland for aiding the Al-Qaeda linked Al-Shabab group by letting their members and families freely live and roam in Somaliland, warning the arms would fall into the hands of the terrorist group. 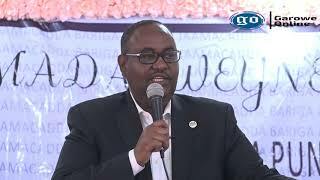 “Those arms consignment can prompt a new conflict between the two administrations,” added Puntland Minister who denied reports that the seized arms ship was chartered for Puntland. The UN Security Council had imposed arms embargo on Somalia at the height of the civil war.